Lifetime of a modern vessel is about 25 – 30 years and when the idea of ordering a new ship is born, a number of steps and people that gets involved will follow, that acts to support the truly international business of shipping. Whether it’s the lawyer checking the contracts, the financier delivering the capital, the seafarer crewing the ship, the port worker handling the cargo, the broker arranging insurance, the pilot charting a safe course, the haulier trucking the goods, the police officer maintaining a secure port, or the chaplain supporting seafarers, the shipping industry is alive with activity 24 hours a day, seven days a week. At this stage the shipowner will start planning for the new ship involving naval architects for the design. Usually previous designs are considered however new and modern technology will be incorporated that meets today´s tougher environmental regulations. A list of preferred suppliers is established based on technology, quality and previous experience (Makers List). All information will be package in to specification that is used as basis for as yards for a quotation. When requesting a quotation a ship broker may be involved. Ordering of modern vessels requires huge amount of capital (a VLCC is priced at >$ 120 million) which means that the shipowner needs to secure ship financing. A negotiation between ship owner and ship yard takes place and it may involve a ship broker to work through the contract supporting the process. Once the contract is signed, engine builders & equipment manufacturers will be involved. At this stage ship owner and ship yard makers lists will be discussed and it will be decided on which equipment makers that will be invited to bid. It will also be decided what classifications society that will certify the vessel. 1. Signing of Contract – When signing the contract a ceremony usually will be held at the shipyard and this is a starting point for the shipyard to begin its process for building the ship. Normally the first payment is done when the contract is signed. The ship is also officially given a hull number and an IMO number which is unique identity that will follow the ship through out its lifetime. 2. Production Design – The production design organizes the design information in the detailed plans into respective component information. The production design enables the field staff to meticulously control a large amount of components on site. 3. Material and Equipment Purchase – At this stage yards starts purchase all material and equipment need to complete the vessel. Since a tremendous volume of materials need to be ordered to build a ship, it is vital to manage and supervise the delivery dates of those materials so that the procurement is timely and accurate. 4. Production Plan – The production plan has a critical impact on manufacturing efficiency due to the enormous amount of components and the large number of workers involved on the job site. It is vital, therefore, to plan thoroughly so as to control and supervise the flow of materials, work volume, job assignments and subsequent progress of the shipbuilding process. 5. Steel Cutting – Steel plates are being cut in to the parts that will form the the hull and deck sections of the ship. The process of heating and bending a steel plate into curved shapes is of great importance in shipbuilding, and requiries sophisticated skill and technique. Normally second payment will take place at this stage. 6. Assembly and Mounting of Ship Sections – The cut steel is assembled into smaller blocks that in turn are assembled into larger sections that mounted together to finally become a complete ship. 7. Launching – When all the blocks are mounted and jointed, launching is the next stage. While the launching at a dock simply means filling the dock with water to float the ship, the launching from a building berth is a very impressive and exciting sight to see since the ship slides its way majestically into the sea. This is one of the most thrilling moments for all involved with the shipbuilding process. Third payment will normally take place during launching. 8. Finishing of the Vessel – After launching the vessel is finished up at the quay. Starting with finishing work of accommodation and control sections, every equipment and instrument is checked and re-examined in practice. We are now in the final stretch of shipbuilding. 9. Sea Trial – At sea trial the ship and ship equipment performance is tested and the result is kept as a performance record of the vessel. 10. Delivery – A new ship is born. After the delivery ceremony, the captain, chief engineer and crew embark for the ship’s maiden voyage. Final payment is done at delivery. 11. Warranty – Warranty period of a new ship is usually 12 – 24 months depending on the contract. 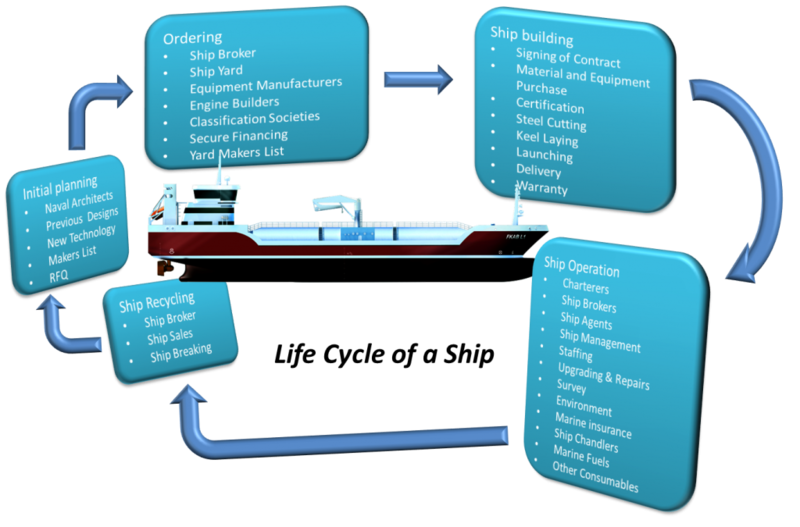 Modern ship operation is a big and sophisticated process that involves a number of people at authorities and different companies. During this period of the ships life it will generate money for the owner who will get his return on the investment. After 25 – 30 years of service or when repairs and retrofitting cannot be financial justified the ship is recycled. Normally the ship owner sells the ship to a ship scrap yard for demolition. At the yard all the steel and some of the equipment is reused or sold in th secondhand market. For safty, helth and environmental issues in the past the IMO has set up new rules for the process.